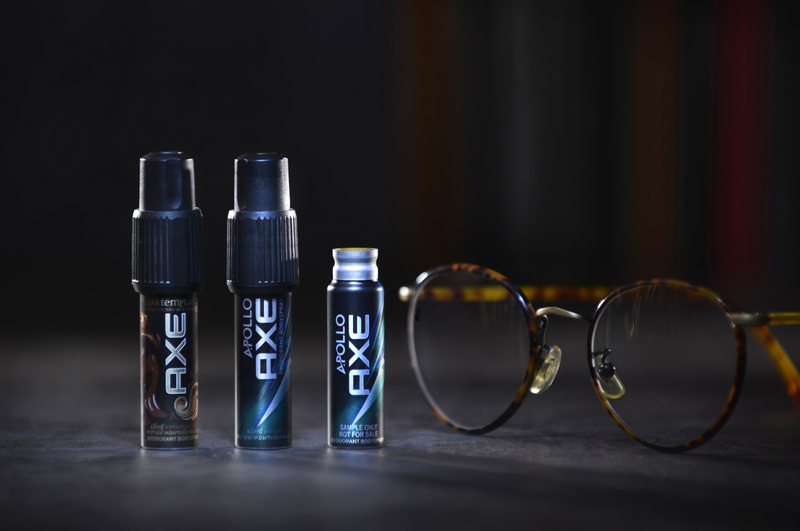 The can with its 360-degree printing and deep shaping for 90 mm from the top is a real eye-catcher. 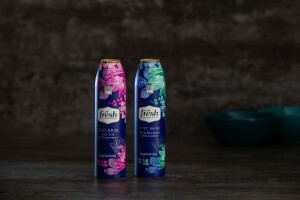 The design of the can is captivating with its fascinating colour combination. 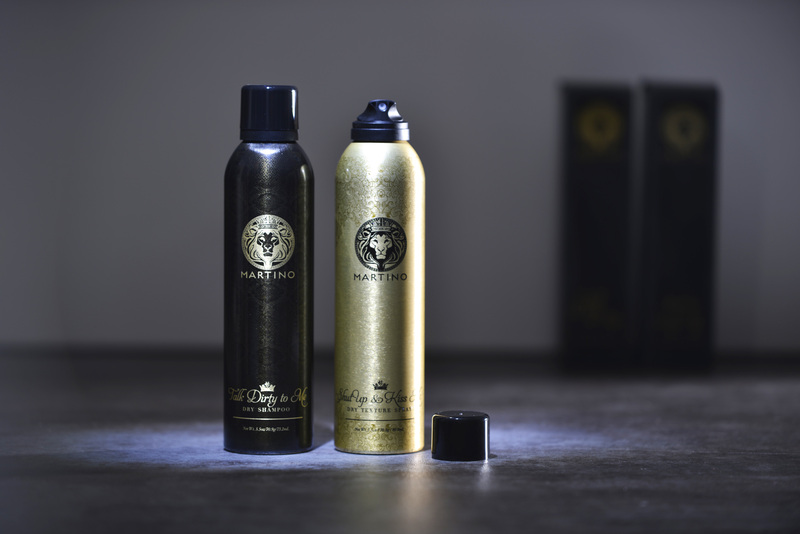 The glamorous appearance is crowned by a glossy oriental-looking gold-plated cap. The colour design of the cans was based on the shirts of the national teams competing in the football world cup in Russia 2018. 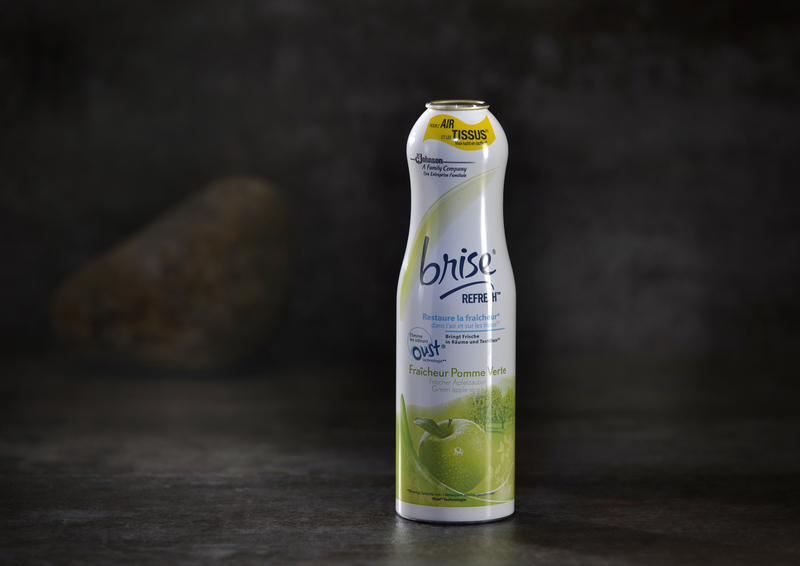 The intelligent combination of opaque and translucent printing technology gave the cans added value. The One Push Vape can uses a metering valve to control the dosage per spray. 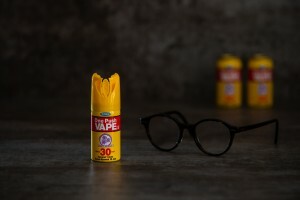 The spray cap was designed to look like a large-size aerosol insecticide to visually demonstrate and emphasise the high efficiency of the product. 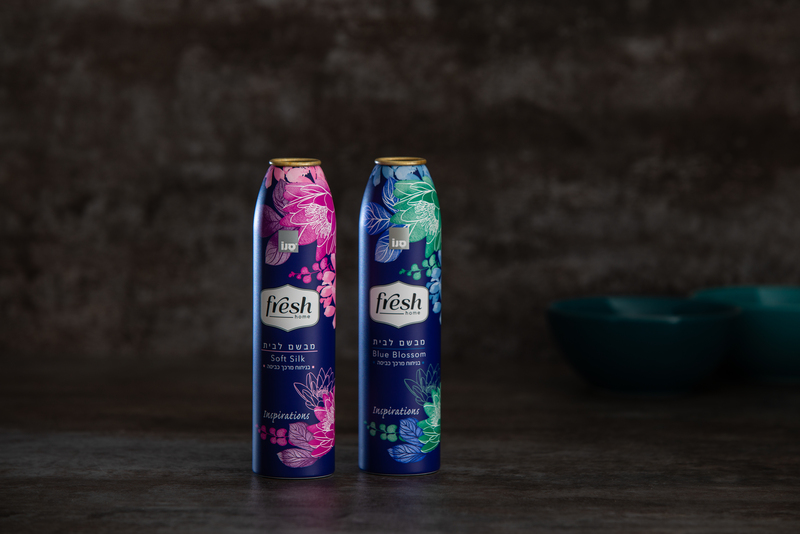 The fun curlicue design of the can creates an inimitable appearance that is only bettered by the can´s extremely bold and unusual colouring. The gas-free metered pump means it is safe for any environment and eco-friendly. 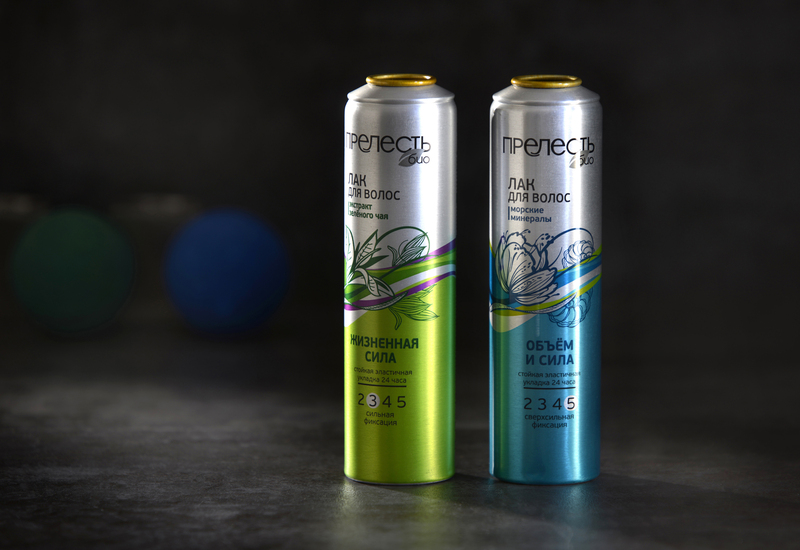 The different fragrances offered by the deodorants are reflected in the colours of the cans. 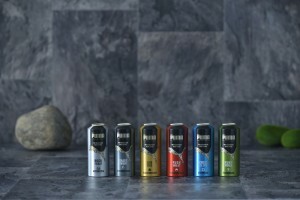 The cans are distinctive, elegantly decorated and ergonomically shaped. 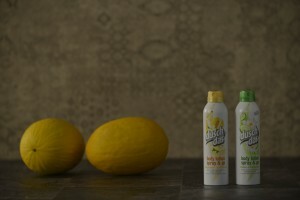 Not only does the special shape of the can support and facilitate handling during application. 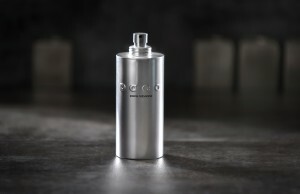 Its unusual shape also provides product and accompanying identification. interior lining, and a clear over-varnish. 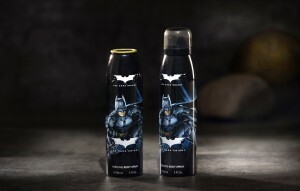 Above all, however, it is the exceptional print quality that makes the can stand out. The floral design of the cans with its filigree images comprising extremely fine patterns and subtle colour gradations is particularly impressive on the dark background. 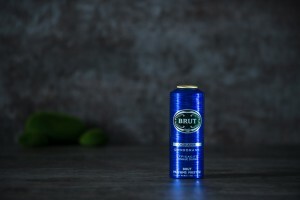 The unique shape of the can, which resembles an hour glass, and the elegant, metallic cap complement each other perfectly to give the can its impeccably shaped look. The delicately composed artwork conveys a splendid look of luxury and perceived value. The particular feature of this can is something that you cannot see. 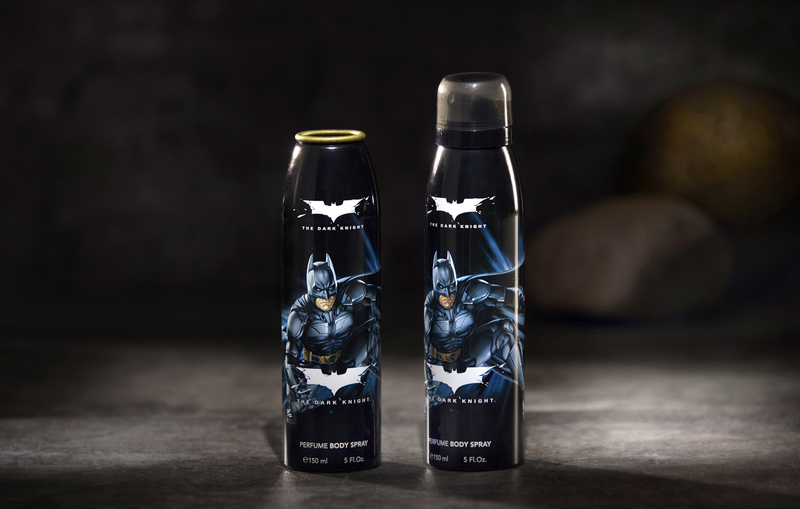 It is produced using an environmentally friendly water-based over-varnish. 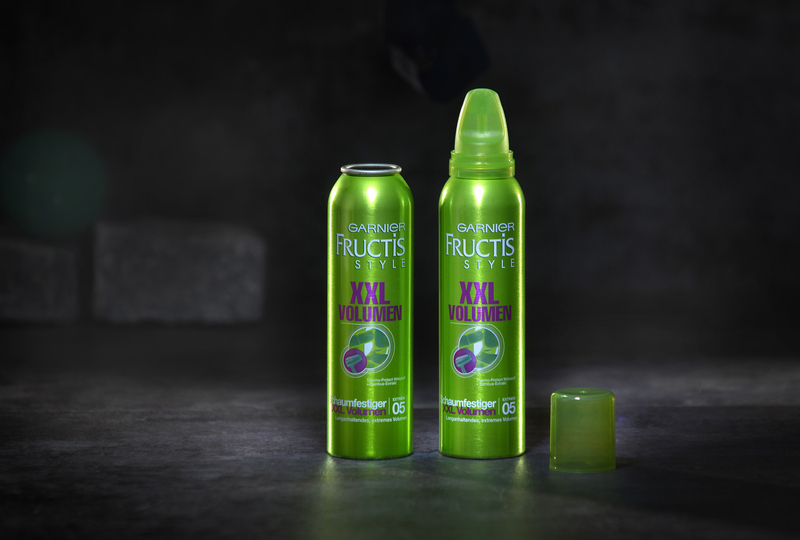 With a new technology the quality of the application, brilliance and colouring is now equal to that of standard solvent-based varnishes. The unique impact of the artwork with its fine, extremely intricate elements is achieved using an elaborate and very complex decoration process involving hot-stamping. The front lettering and flower pattern are produced by gold embossing and the purple-coloured areas use conventional printing technology. 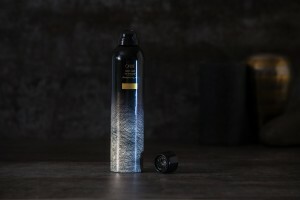 The Free Styler Working Hair Spray from Oribe is available in three different sizes: a 53×205 mm can, a 38×106 mm travel size can and a 38×76 mm can for the handbag. 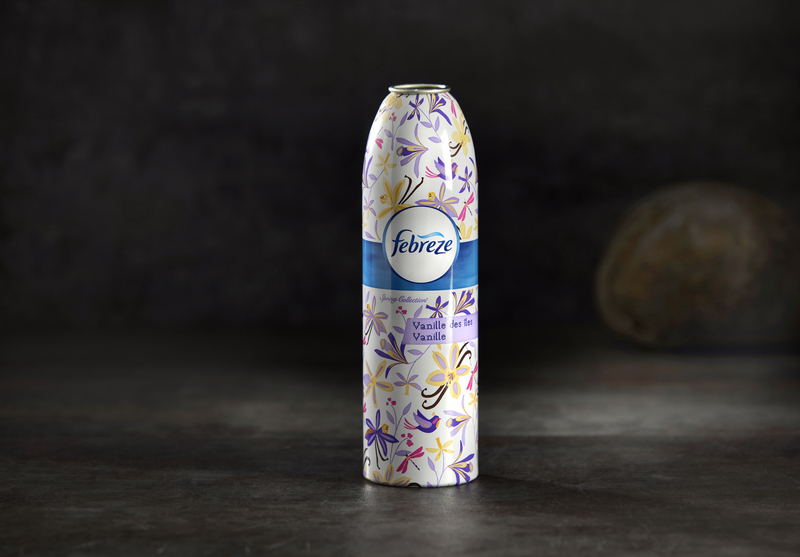 With their reserved elegant design, all the cans are impressive. Each rectangular area of the draft received the colour shading the client wanted using the appropriate dot sizes. 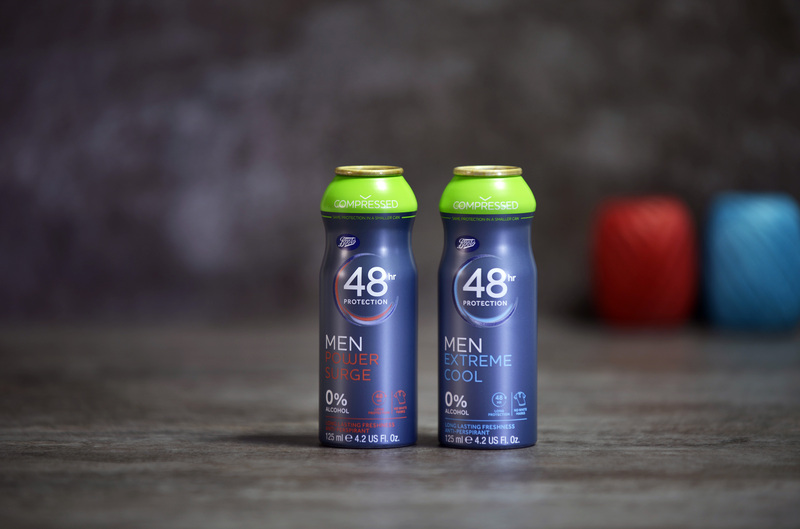 Shaped cans play a significant role in branding and product differentiation. 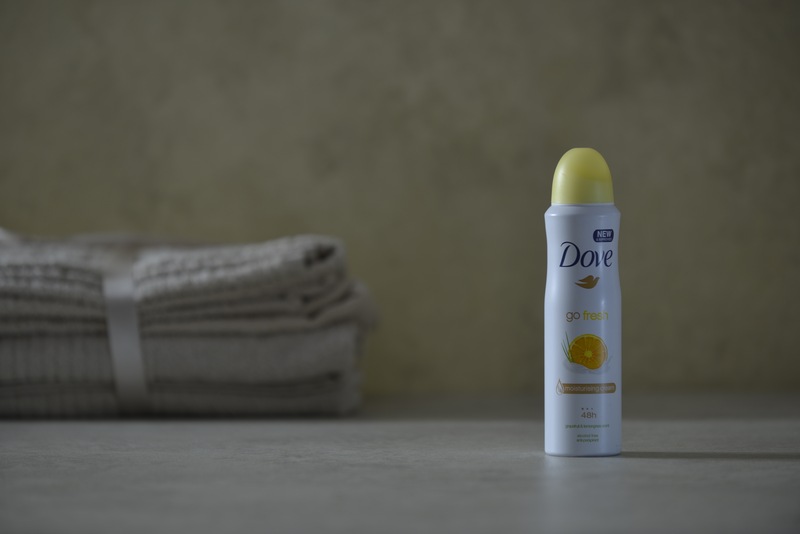 The specially developed shape of this can emphasises feminity with its soft, flowing curves and at the same time is ergonomically perfect to hold. The feminine impact of the design is supported by the artwork. The black, brushed metal cans, with crisp labels that run vertically over the cans, impress with their cool appearance. 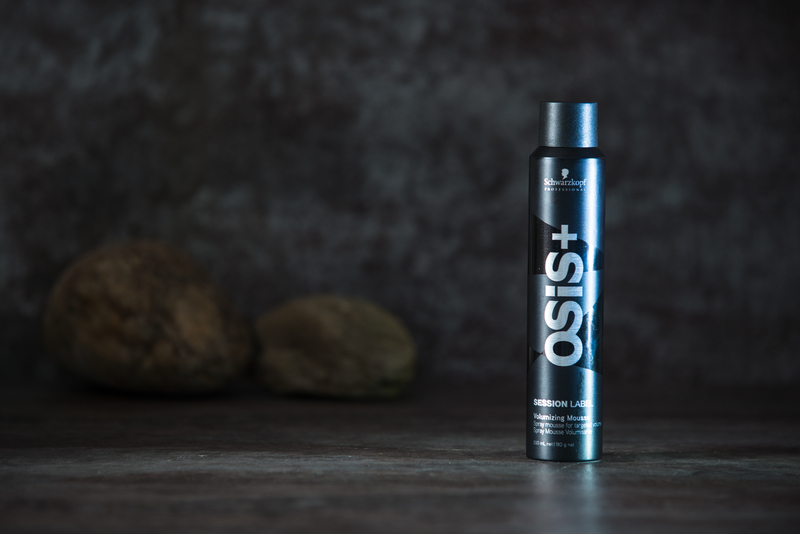 The matt and gloss printing technology creates a super contrast between the matt background and the shiny black and the glossy brushed silver logo. This gives the can its unusual avant-garde look, which is boosted even more by bold and sharp gloss black triangles. 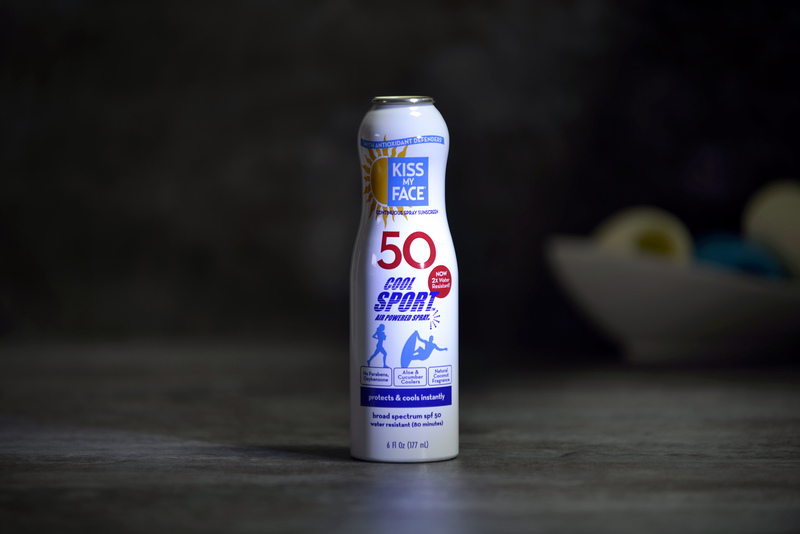 Skincare sprays are opening a new market segment in the personal care sector. 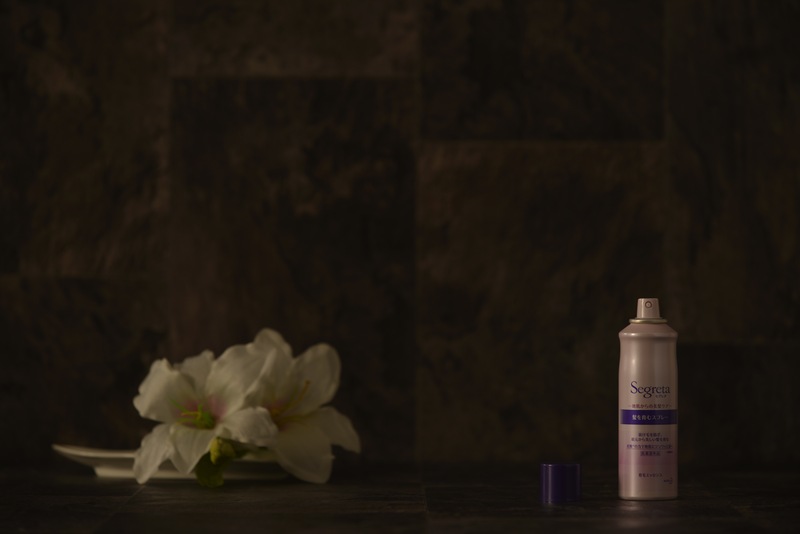 The sprays can be used throughout the day to stabilise the pH of the skin, supply minerals and give a refreshed feeling. 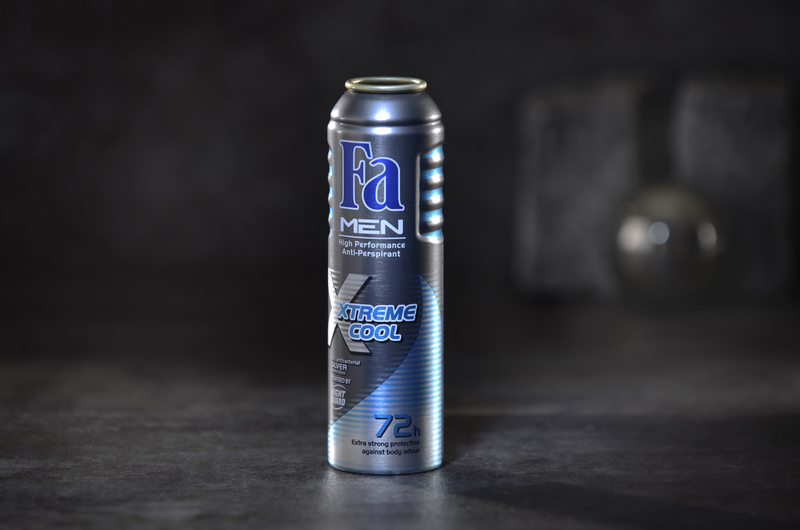 The can´s design and form support this product promise: An excellent example of the innovative potential hidden in aluminium aerosol cans. 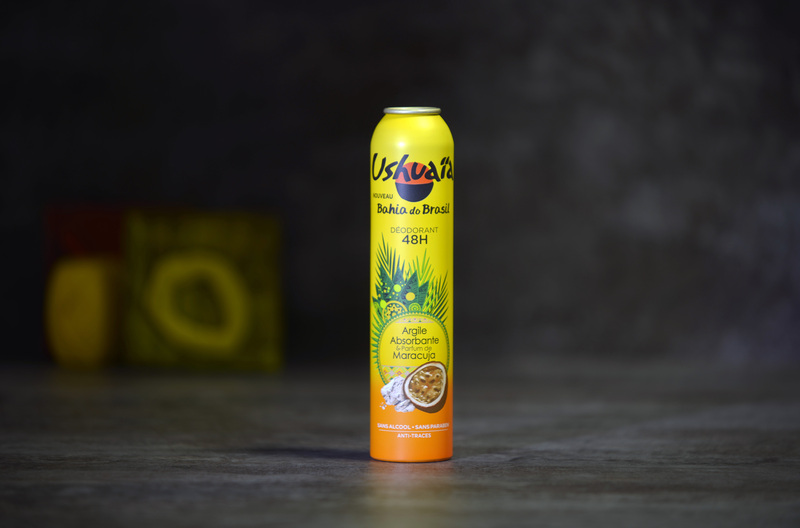 The aluminium can is specially designed for the Arabian market. 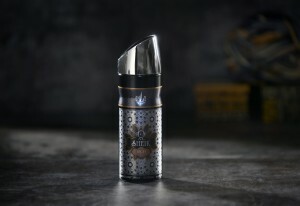 The combination of a deep shaped can and a special cap design gives the product an authentic Arabian feel and style. The can´s elegant matt finish creates a modern stylish look and adds a premium touch. 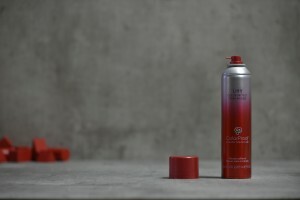 The can is made from commercially pure aluminium (99.7% aluminium) so it is completely recyclabe. It is possible to print in up to eight colours. Furthermore, there is emphasis on ideas relating consumer protection and sustainability: Product dispensing that does not allow propellant to come into contact with the product and a form fit between piston and shoulder that allows almost complete evacuation of the product. 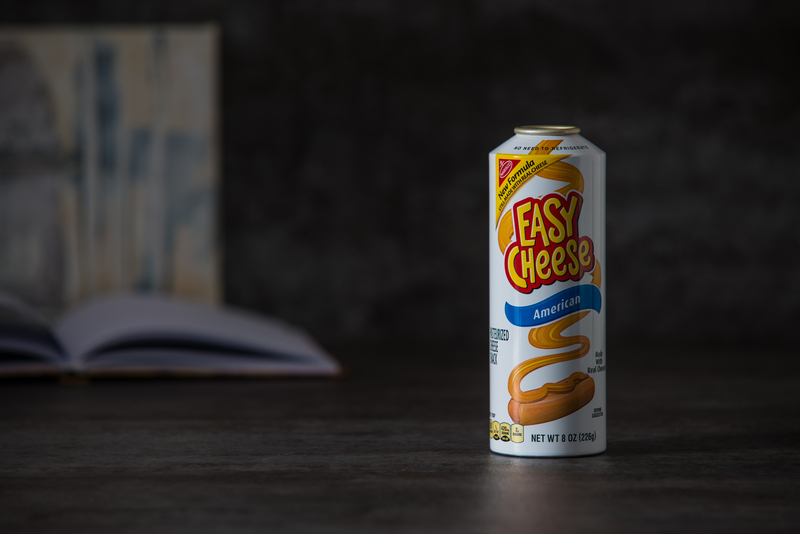 The ideal packaging for food-type products. The cans differ in shape and colour but the brand´s persuasive uniform overall appearance is clearly visible. 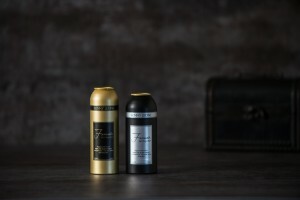 The metallic gold and silver elements of the design combined with the elegant black give both cans an extremely high-grade look. 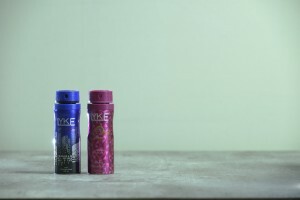 Six-colour halftone printing was used to print the can together with a Microflex internal laquer and a Valspar varnish. 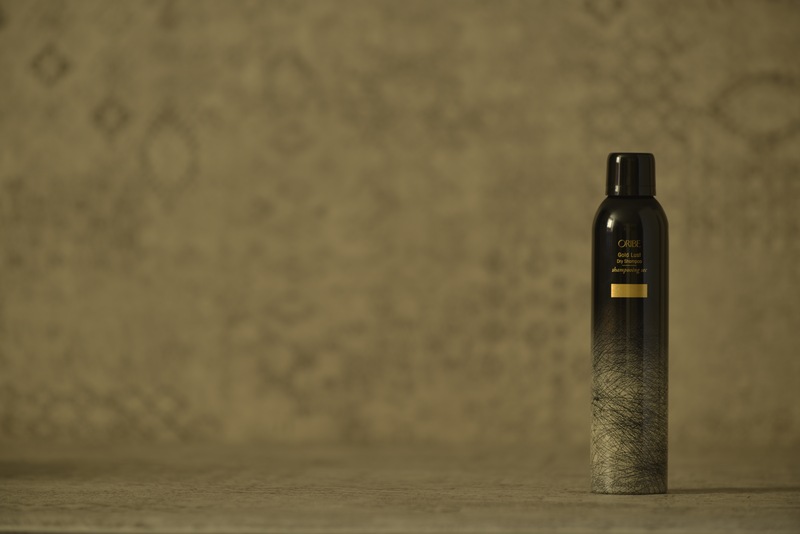 The can´s clear shape with its characteristic groove contrasts with the harmoniously swung lines and areas. 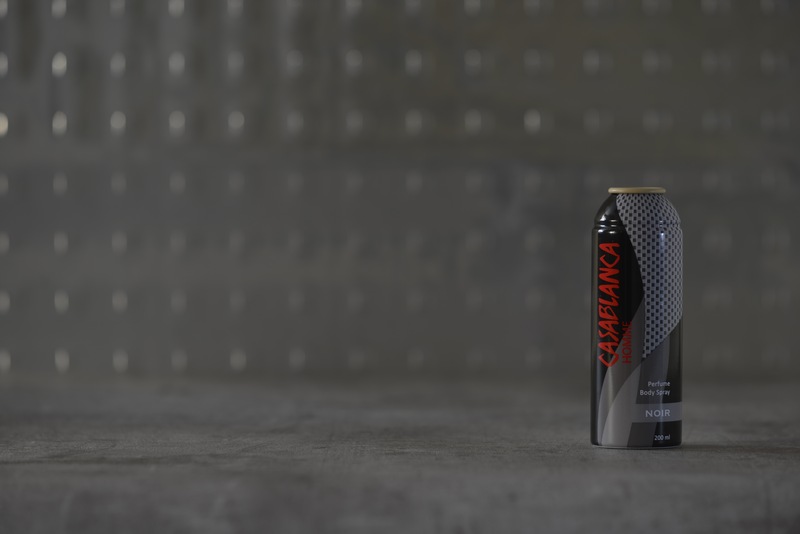 The asymetric design with the red lettering of the brand and the screened areas give the can a dynamic look. 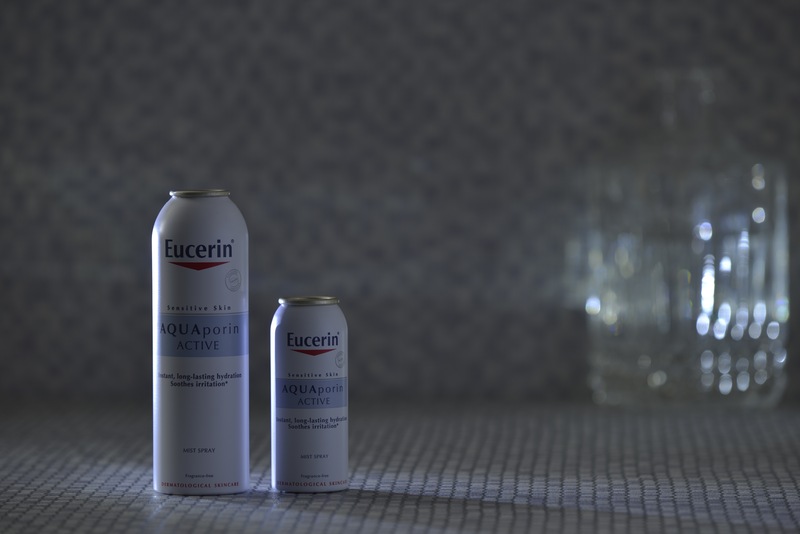 The all-over white basecoat gives the aluminium can a pure and tidy appearance. 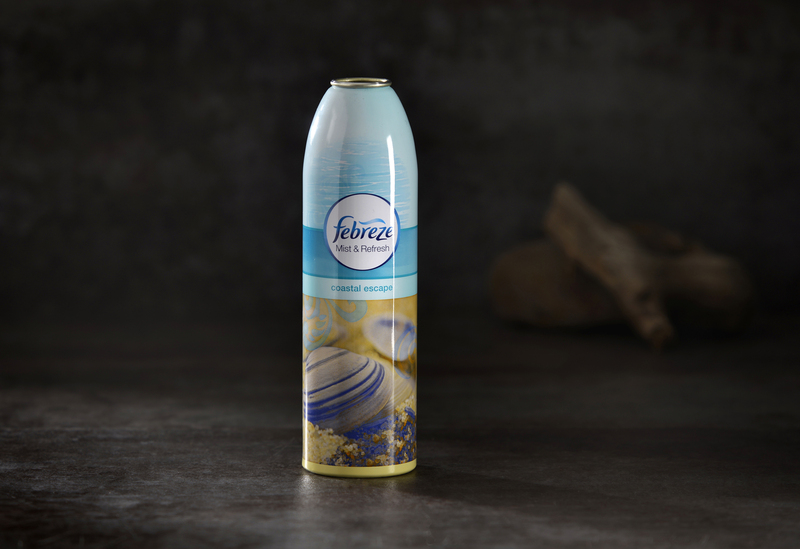 The plain and simple print combined with a satin finish enhances and strengthens the appeal of the clean aerosol packaging. 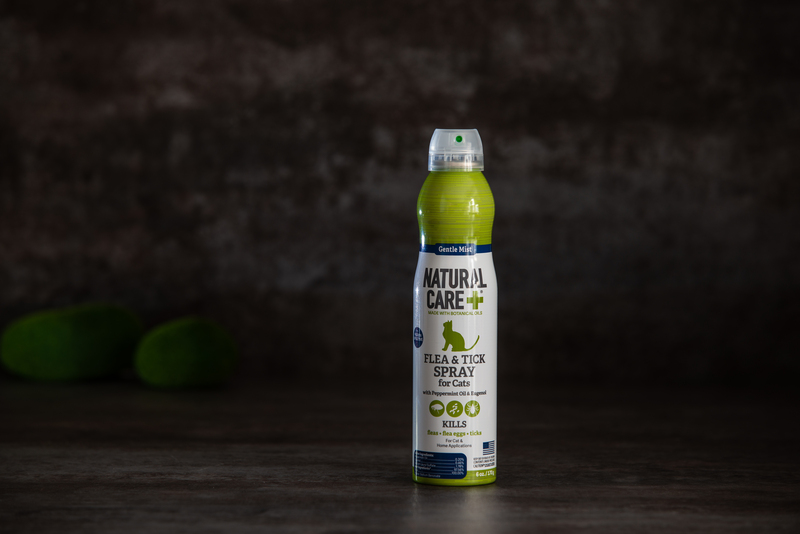 And thus the hygienic and clean look of the packaging stands not only for the product but also for the excellent hygiene and clean use of the aluminium aerosol can as a form of packaging. Thanks to the excellent print, the respective landscapes and silhouettes on the brushed aluminium mysteriously appear to be transparent. The horizons and the indivual details of the motifs are reproduced with unexpected precision. 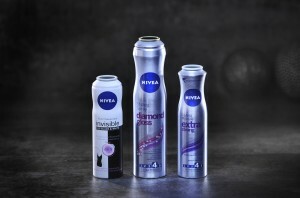 The customised shape has a very smooth transition in the can body that extends from the bottom of the can up to the top, and terminates with a sharp transferable neck that allows a smooth connection to be made between the can and its actuator. The artwork is beautiful: Metallic structures stand for the perceived high value of the product. 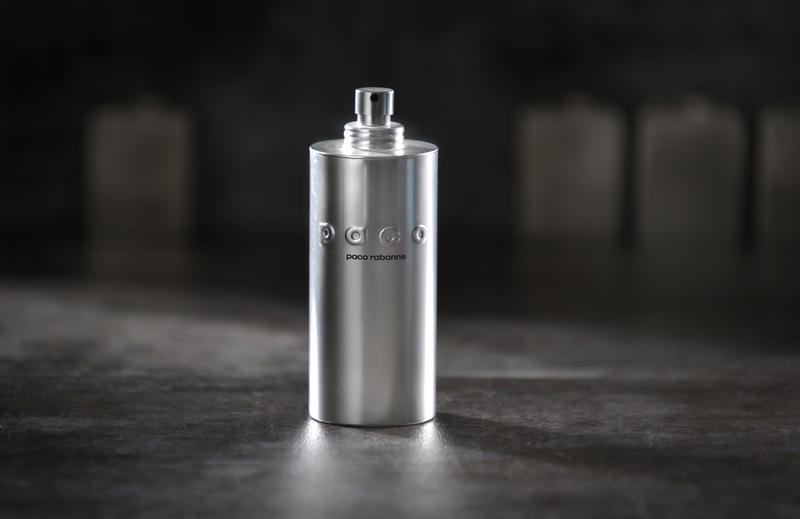 The can has an extremely elegant, slim shape with an ogival shoulder and sleek matt and gloss lithography. 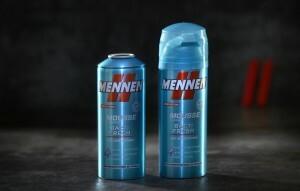 The dark matt colour with a pop of metallic silver and the lettering lend an air of luxury to the can. An interesting and unusually shaped can: over half the can length undergoes necking; first there is a gradual reduction, followed by an expansion and then the final product has a tapered shoulder. Seven-colour printing and a special semi-matt finish create a real eye-catcher. The design and the look is the result of a complex printing process. It starts with a high quality basecoat for extra shine. Then comes the perfectly smooth gradiant, which is created on the press using a full length solid plate – only with the text and graphics knocked out – and a split well to divide the colour and transparent ink. The 53-diameter aerosol can with a clear brushed aluminium finish, gold PAM liner and clear overvarnish impresses with its premium look. Artwork and the highly sophisticated printing process are very elaborate. 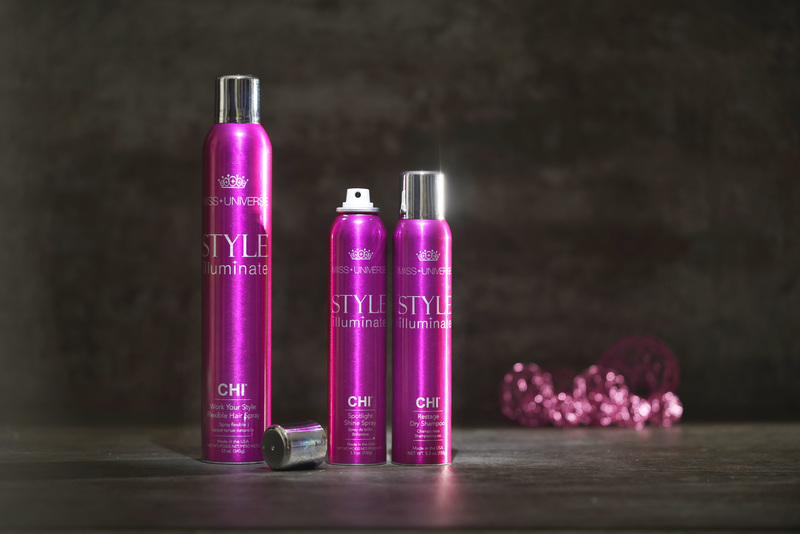 The thin hair patterns had to be printed with highest precision and the fine gradations on the can require similar accuracy and expertise. The twin ink-duct system allows seven- or eight-colour designs to be produced on Polytype printing machines, originally intended for only six colours. 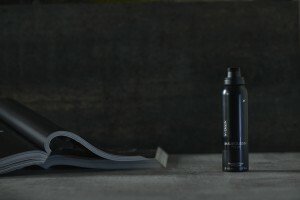 Besides achieving significantly better cost efficiency, this technique also has a marked impact on the print result as well. 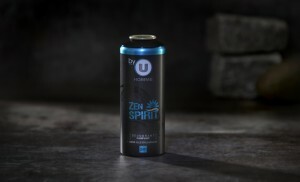 The design of the can is very clear and almost puristic. The motifs and the graphical elements are printed very precisely and in rich detail, the finishing is of high quality. The design concept fulfills its function perfectly: One can see at first glance which product the can contains and what the customer can expect. 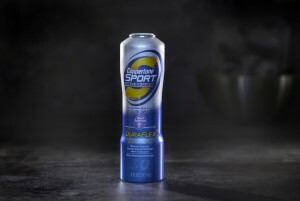 A newly shaped aerosol can to complement a newly designed spray-through actuator. This actuator harmonizes perfectly with the can´s new form, and the design and artwork merge perfectly into a new and attractive look. A uniquely shaped aerosol with bold matt-finished colours to identify the six initial fragrances of the range in an harmoniously composed colour spectrum. A real highlight in form and design that combines the vibrancy of the product with the highest values of the two global brands. The elegant shape creates an interesting look and at the same time a secure and pleasant grip for the customer. The can shows a very clear and sharply contoured printed image: This is because it is printed directly onto the pearl layer so that the pearl structure is not superimposed onto the text or patterns. 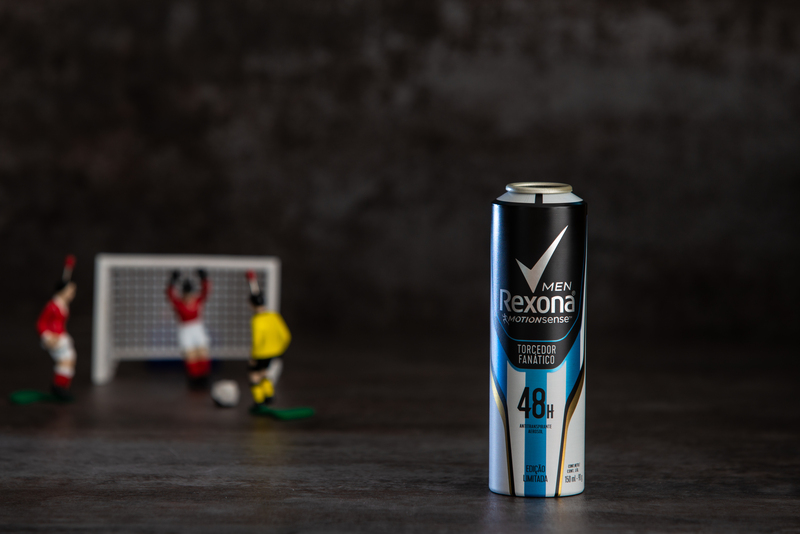 It is the balanced mix of opaqueness and gradations that creates the can´s harmonious overall appearance and is proof of the outstanding print quality. 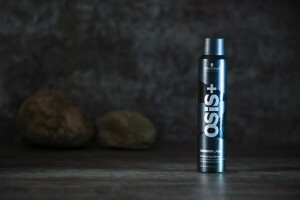 The brand name appears as a reversed-out printing surrounded by an iridescent, highly opaque silver background. 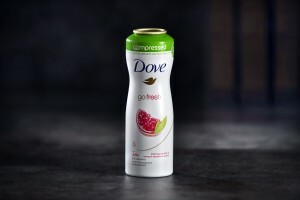 Compressed Technology reduces the use of material and improves the carbonic footprint. Shape and design match the product and application perfectly. Characteristic rings ensure a clear differentiation at the point of sale and a secure grip and a simple handling for the customer. 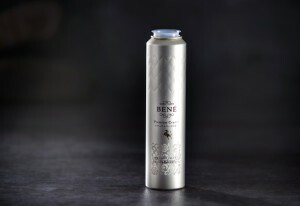 The elegant shape of the can is ideally complemented with the print design. 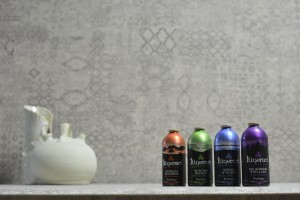 Special inks and printing technology: filigree ornamental patterns and gradations with the luxurious appearance of the material. A very elegant colour balance on a pearlized base-coat and matt over-varnish. An extremely complexe and sophisticated printing technique for the impression of exclusivity and pure luxury. State of the art prepress software and computer-to-plate technology ensure the highest quality an an outstanding print result. 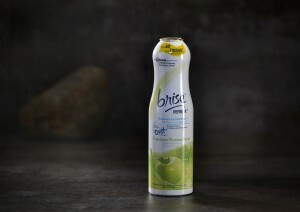 The green band reminds the consumers of the positive impact on the environment by using compressed technology. 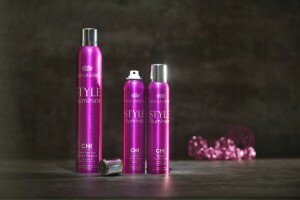 The combination of shape and soft colours create a very feminine product. The combination of slim format, matt and gloss with the aluminium see-through for a unique appearance. 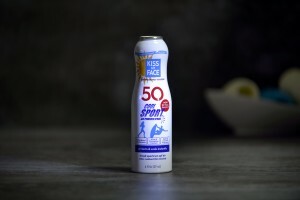 A striking example of a collaboration between the content and the print design of the can. 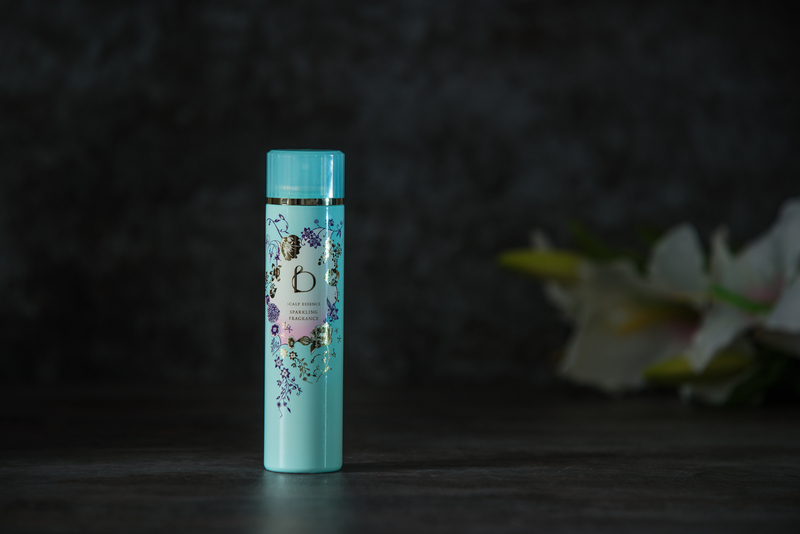 The design shows the vanilla blossom and the vanilla bean in harmony with birds and dragonflies. Close-ups show the details of the print. 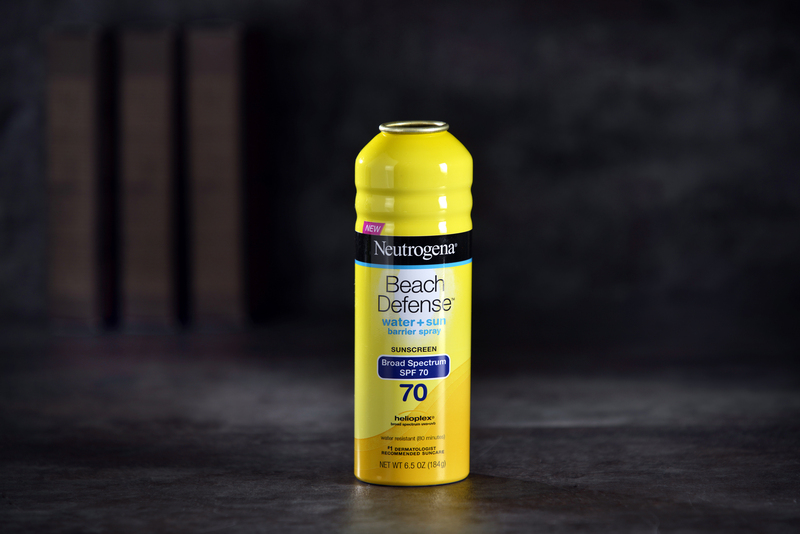 A 53 x 140 AD shoulder can with a transparent basecoat. Printed in 8 special colours with a matt overvarnish. 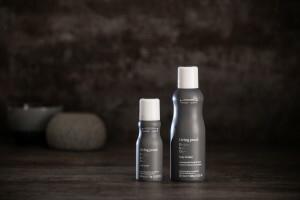 Puristic and elegant design. 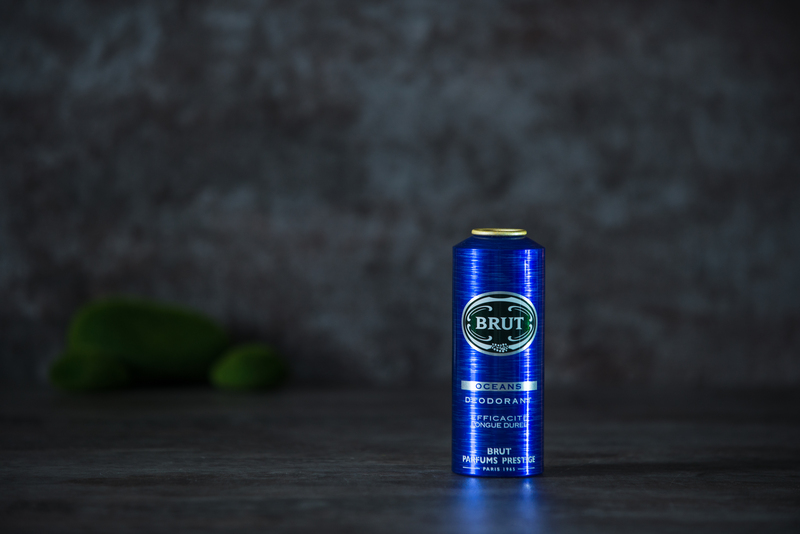 The shape of the can and the stamped brand name underline the premium appeal of the aluminium. 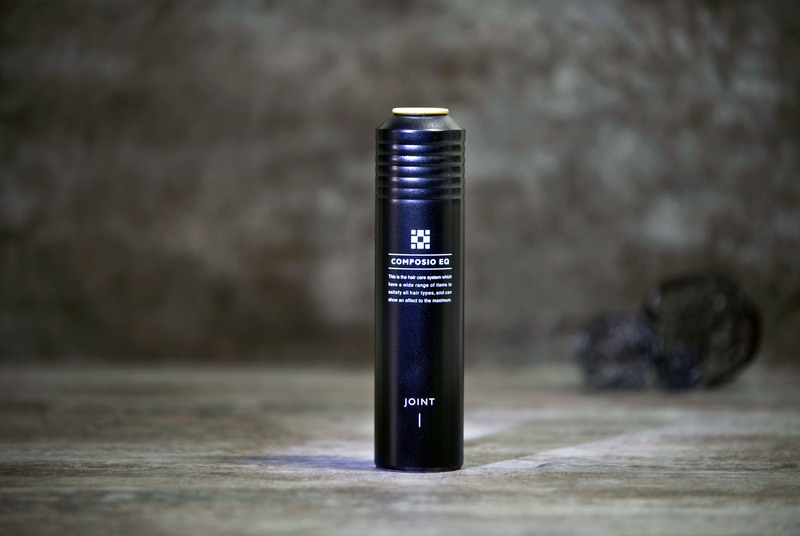 The probably smallest aerosol product in the world with 15 mm diameter: pocket sized, portable aerosol can for on-the-go fragrance. 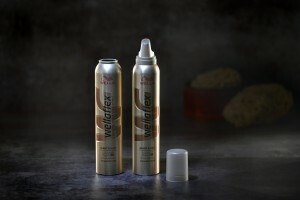 The embossing around the big letter ”W” is interrupted in the middle to allow smooth space for printing the brand “wellaflex” on top. The print and embossing is perfectly aligned and makes this a visual and haptical experience. 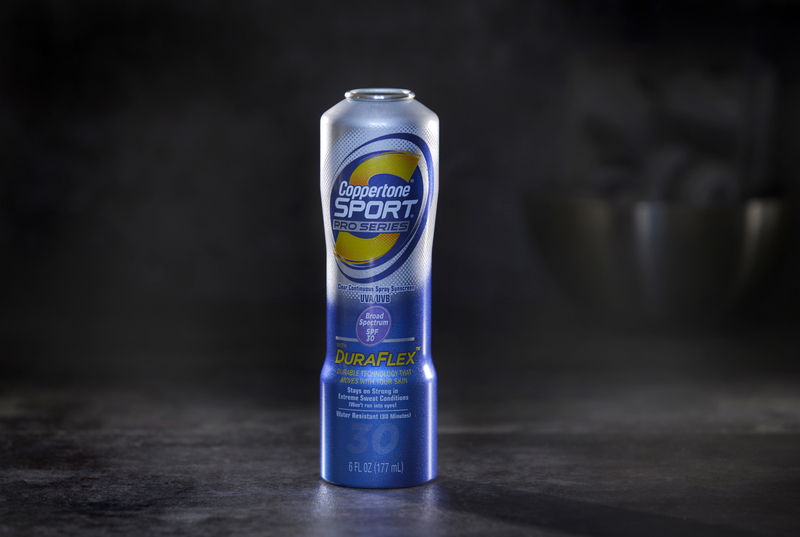 The full-body shaping technology allows marketers to create unique eye catching package from the top of the can down to virtually the can bottom as evidenced in the Coppertone Sports Pro Series Continuous Spray line marketed by Merck. This can impresses with its bullet shape. The design which was created with 8 colours was achieved by an ink separation device and by applying a white base coat. 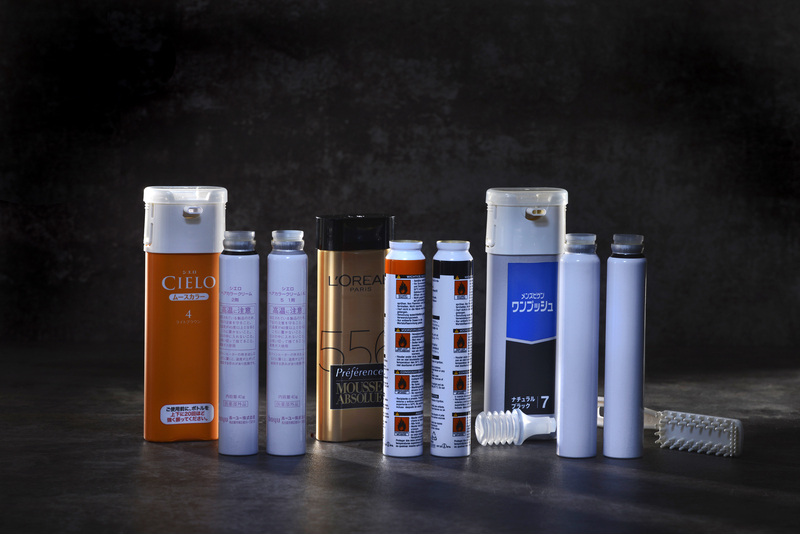 Examples of double can systems for hair colour (cream-type), diameter 28 mm, automatic (easy application), reusable. The innovation resides in the visual effect created by the combination of embossed-debossed body shape and the corresponding printed design. The final result is a new elegant aluminium monobloc can. 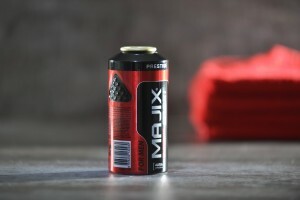 This is a can with an extreme shape. 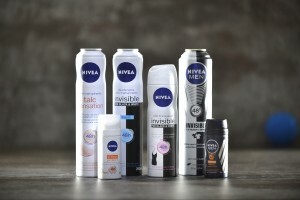 And it shows excellent craftmanship in terms of printing regarding the brand logo “Nivea”. 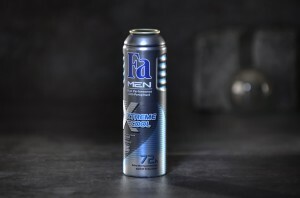 The logo is set and printed in a way so that after shaping and necking of the can the logo appears round – resembling the famous blue container. 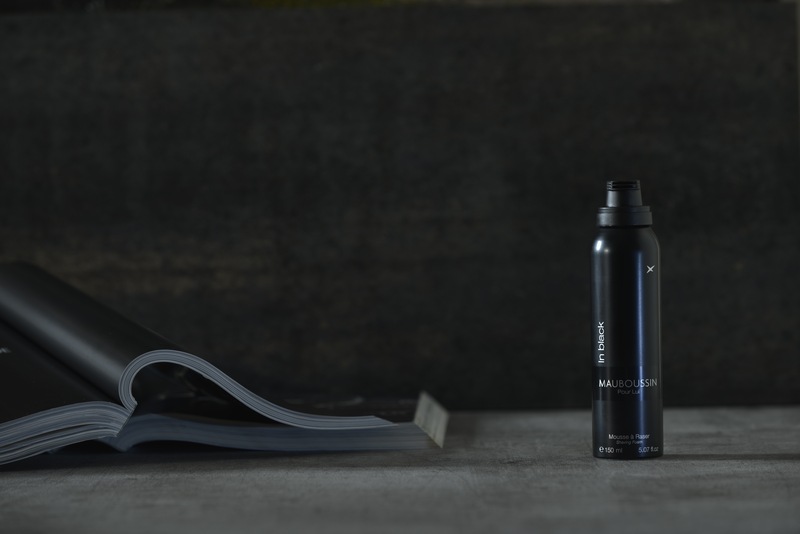 The innovation of the can is the internal lacquer. In this specific case it was possible to use epoxy powder coating which is solvent free as a substitute for PAM internal lacquer. 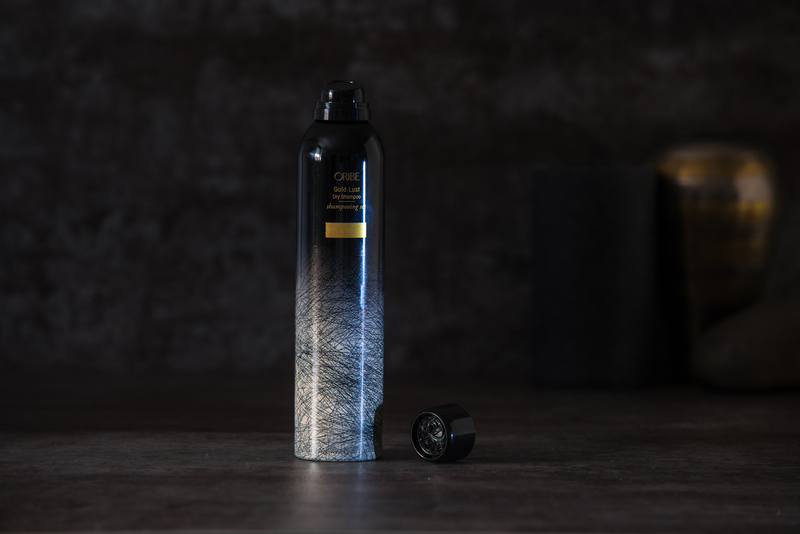 The Pure Silk container is printed using a combination of four colour process and matching colour on a brushed aluminum monobloc aerosol container with a glossy exterior varnish. 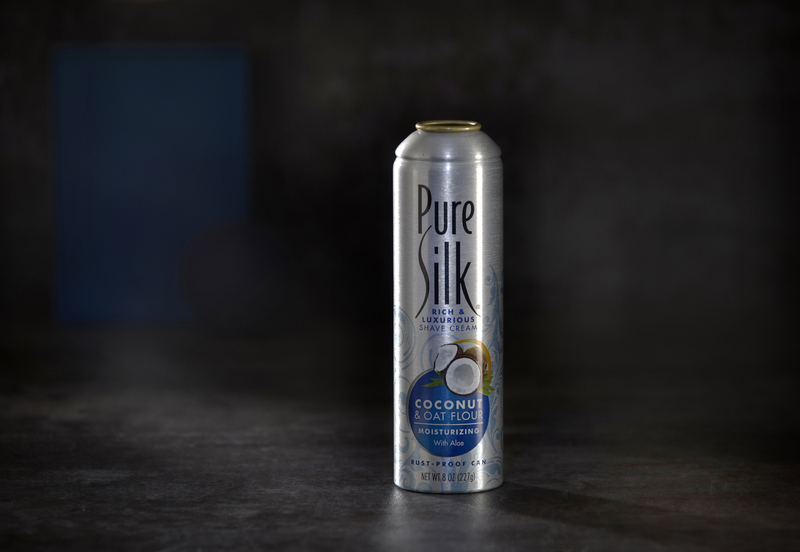 This can has an eco-gorge shoulder with a one inch outside curl. 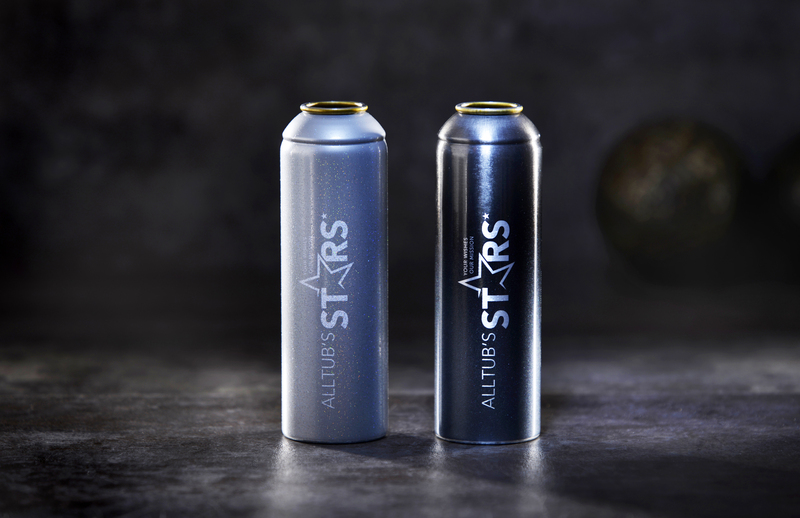 This aluminium can has a new format – diameter 50 mm – and can be combined with a spray cap. The can has a very modern and simple design with a brushed effect. The Nivea cans are well known for their distinctive shapes. 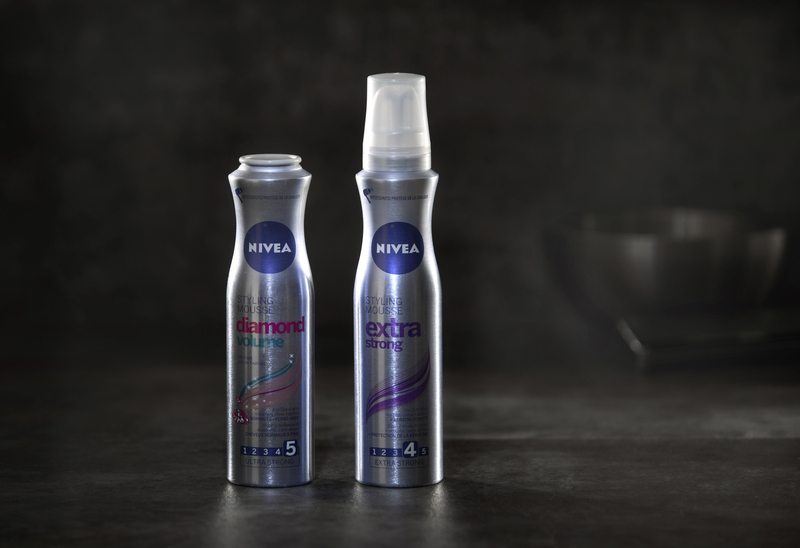 Regardless whether the shaping is smooth like Nivea invisible or the shaping is extreme – like the female can version with a distinctive edge – the brand logo is always exactly the same. The can incorprates two innovative aspects of aluminium impact extruded can making: Long stroke, extreme shaping and high definition full colour printing. 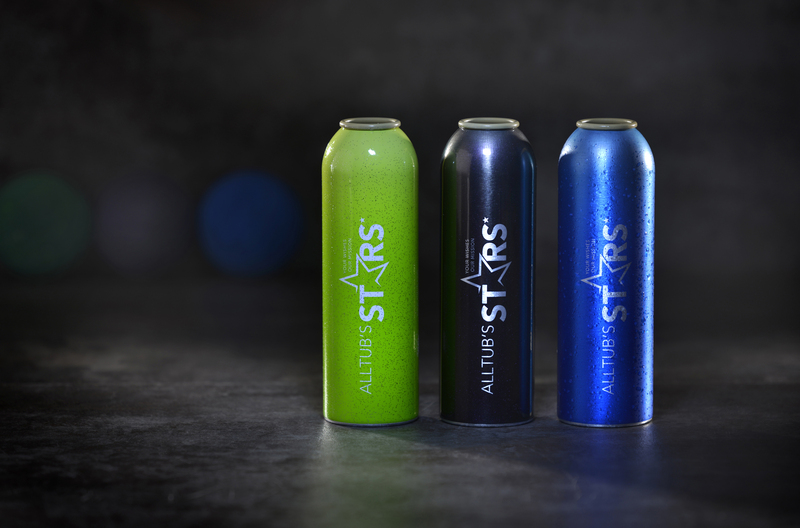 The producer’s capability to print full colour (CMYK) on aluminium cans opens a wide range of printing options previously not possible. 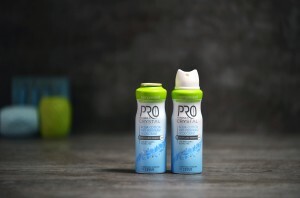 The prototypes on the photos are representing five of the various decoration options tested by Alltub: pearl, droplet, glittering, iridescent and sequin effect. 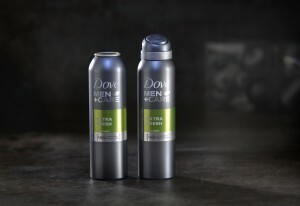 Dove men + Care is a can that offers excellent print design and an ecological and economical approach regarding the use of internal lacquer. A highlight is the use of partial internal lacquer leading to a 50% reduction. 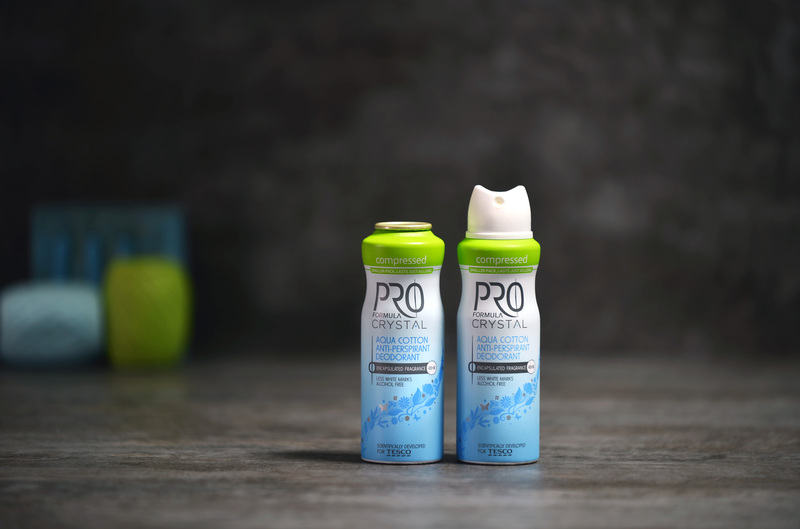 The product itself, an anti-perspirant deo spray, does not require internal lacquer at all. 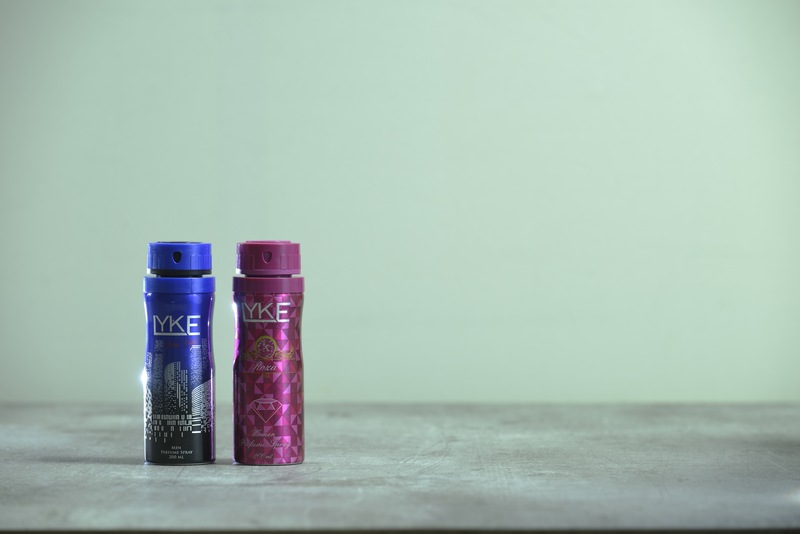 However, a thin layer of lacquer is required for technical reasons during shaping and necking of the can. 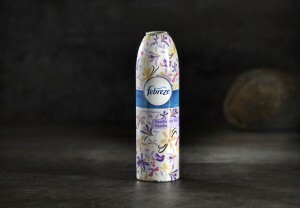 The ergonomic shape of this tailor-made packaging guarantees simple handling of the product. Moreover the shape adopts and focuses excellently the logo. The metallic background looks classy and communicates coolness and elegance. Both elements make a great visual and functional impression. The can perfectly combines optical, tactile and haptical qualities and therefore is the optimal packaging for this sun-care product. 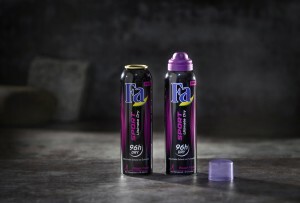 This aerosol can offers an impressive tactile effect. 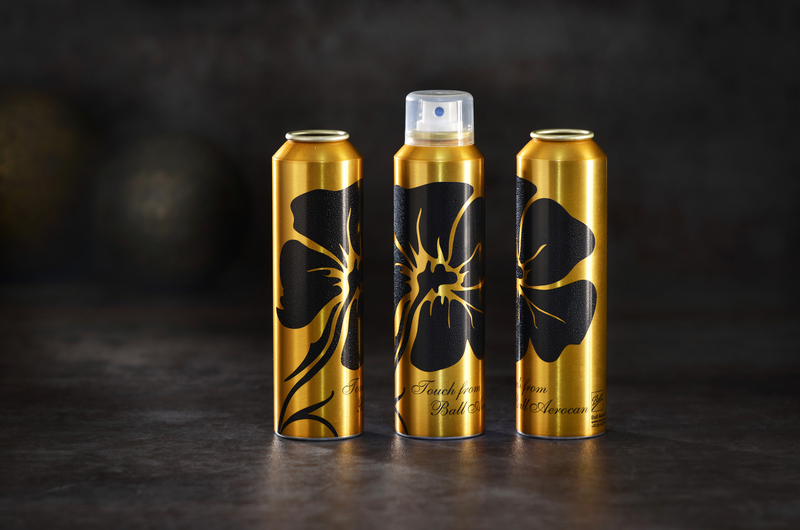 The aim is to customize the can and to generate advantages for the customer through the printing effect with a nice relief and shiny effect depending of the light. 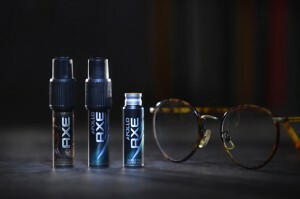 In addition it is an opportunity to prevent counterfeiting. 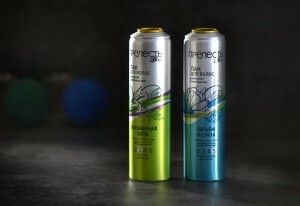 The fresh green catches the eye and the brushed aluminium shines through the print and gives these cans a metallic look. 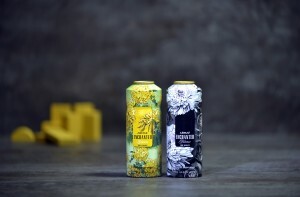 The can is the result of an intensive cooperation between can producer and customer on printing techniques and raw materials. 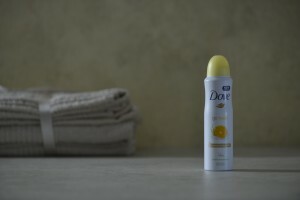 The tactile effect can protect the product against counterfeiting, thus providing a guarantee for the consumer,too. The attractive twin rings on the top sidewall of this container not only add a pleasing look, but also provides an easy grip that will resist slipping during use. 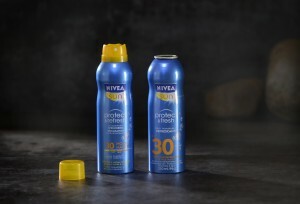 The sunny graphics of this container add to the light airy feel of the container design. 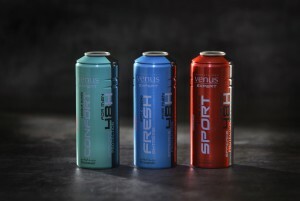 The producers have developed a new monobloc aluminum can in 150 ml can size. This can is produced from the new Ball Recycled Aluminum slugs “ReAl” and represents the world’s first lighter-weight industrial aluminium can with recycled material. 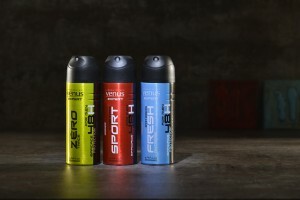 Indeed the Ball ReAl 25 technology allows the brand owner to improve significantly their sustainability impact by using 10 % less aluminium for the same aerosol can performance. 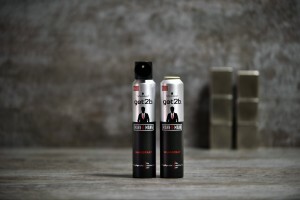 The can has a white base coat which shines through the design. The design consists of contrary raster patterns. The innovation of the can lies also in its content – 125 ml will last as long as a 250 ml deo can. This means less material, less weight and less transport cost – but still an elegant can. 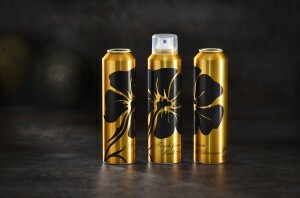 A 45 x 150 mm bullet shoulder can with white basecoat and a four process colour print plus specials, such as the glossy overvarnish. 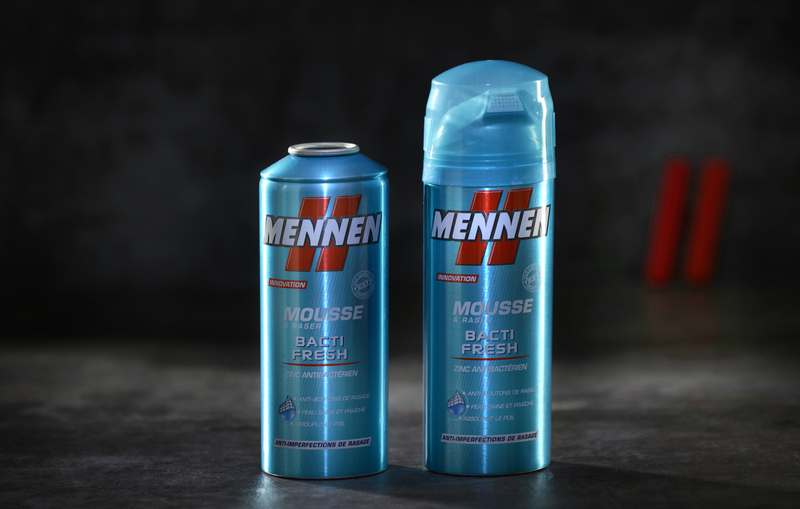 The first aluminium transfer can in diameter 57 mm to allow L’Oréal to switch from tinplate to aluminium aerosol cans for Mennen shaving foam. This technology is now allowing designers to take the advantage of the premium seamless brushed aluminium background to create outstanding artworks. The photorealistic image of a pomegranate with the very fine degrading of the kernels add to this clean and fresh image the can displays. 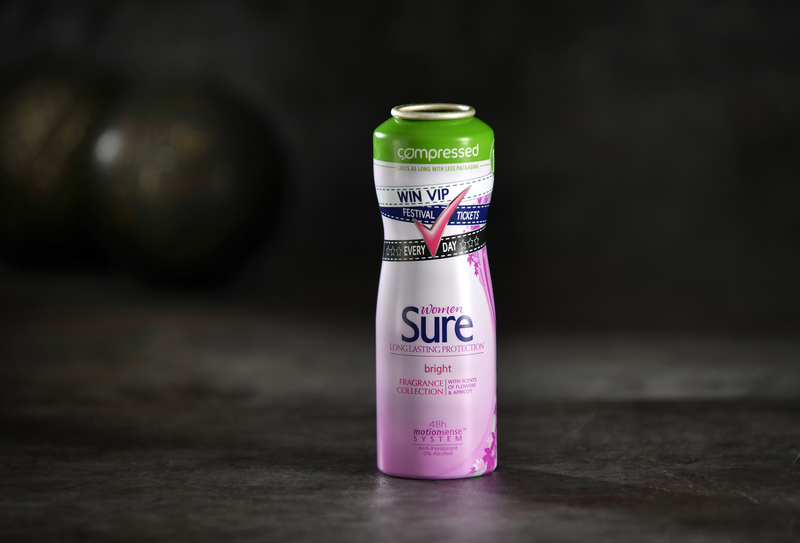 The “compressed” can is filled with a deo concentrate that will last as long as a 250 ml can. 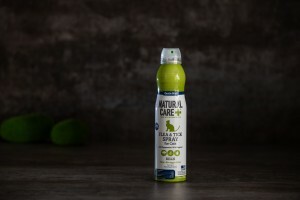 This goes along with material savings and a corresponding reduction of weight and transport cost boiling down to a better sustainability performance of the product. 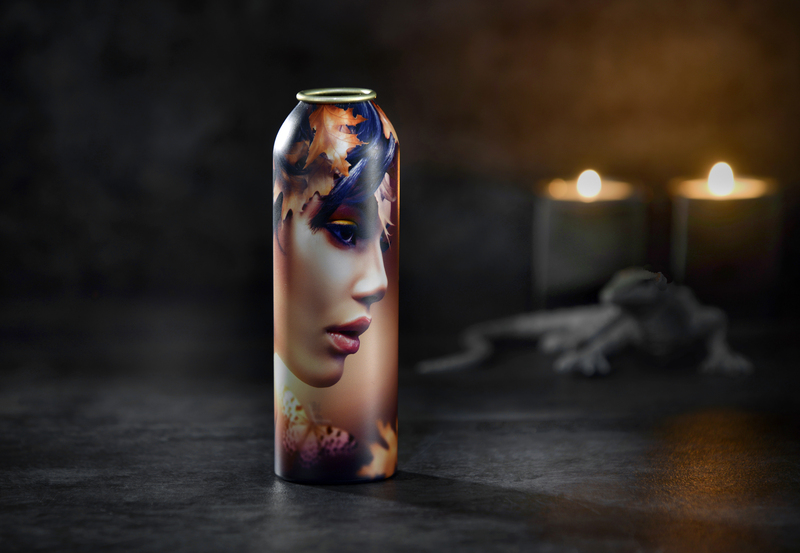 A 53 x 140 mm round shoulder can with a transparent basecoat and a four-process colour print plus specials such as a glossy overvarnish. These cans developed for Laboratoires Venus improve both ergonomics with embossed grips and feel with a tactile effect on the side, combining two innovations on one can. 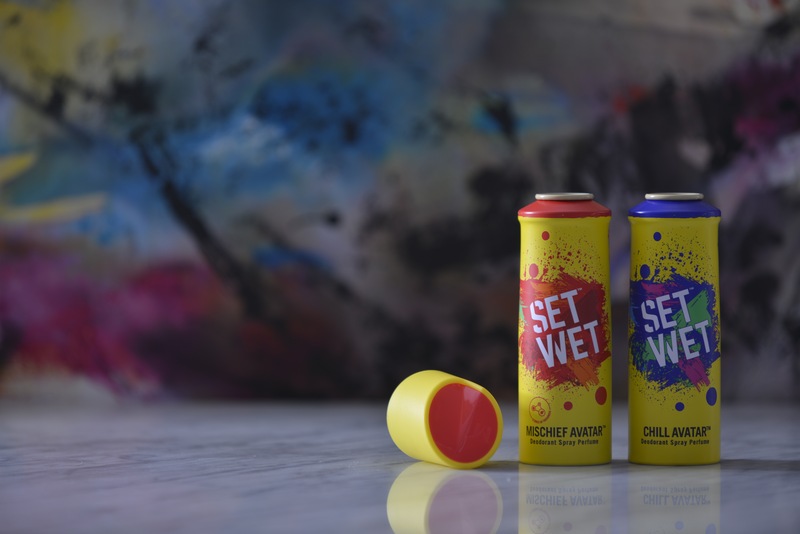 A new printing technology that enables the customer to combine matte and gloss finishes on the same can, creating areas with different look and feel. This new printing process allows you to choose the finish of each colour. 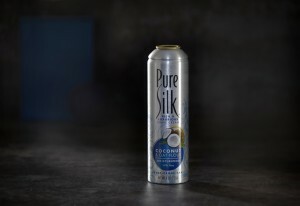 This barrier pack assembles a plastic bag into the can so that the content can be extracted without gas mixing and you will get a whipped-cream-like product. The special surface is realized during the printing process without using an additional tool. The hot stamping is done with a thicker film than in the standard hot stamping process. 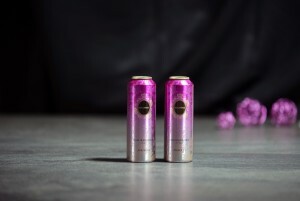 This can with its pink and silver design and its distinctive finely conical shape is a real eye catcher. Print design with fine degrading colours.The brand name in brushed aluminium has a beautifully glow. 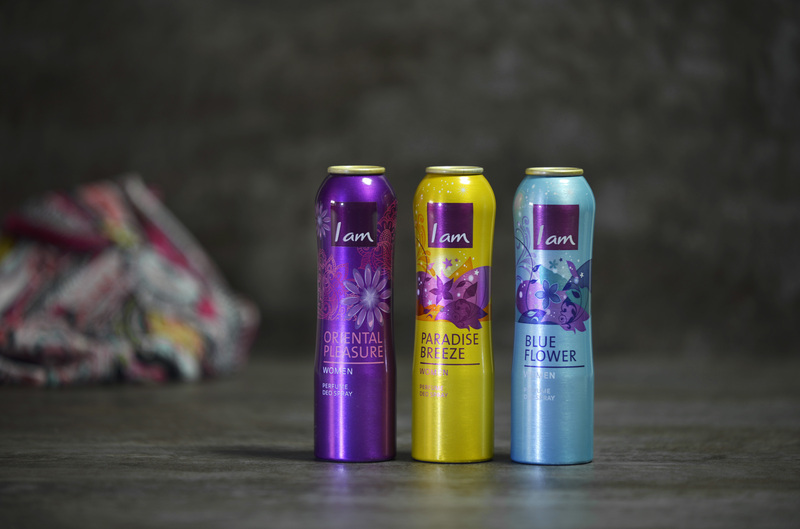 This digitally printed can is an example what state of the art printing systems and complementary colours are capable of. A magnificent print with a fotorealistic image of a woman’s face where the extremely fine degrading is well shown on the cheek bones and on the background of the can design. The oak leaves provide a powerful contrast to the intensive black hair. 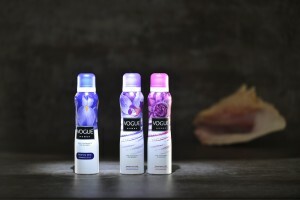 Boasting a feminine shape, the aluminium Vogue Woman cans impress at first glance. They demonstrate the aluminium deep-shaping opportunities. 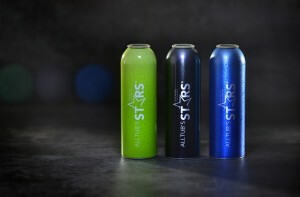 The cans are finished with either a glossy or a matt finish. Utilizing metallic colour gradation of the can body and embossing the sides present a visual effect that demands consumer attention. 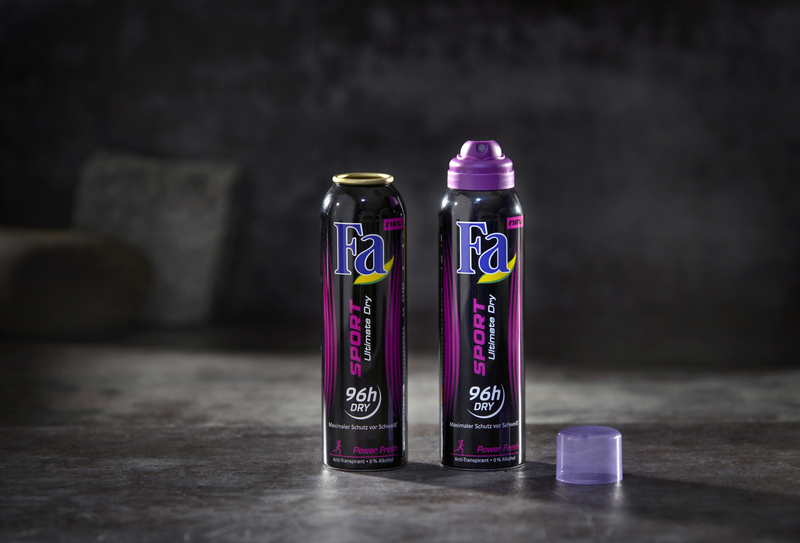 The brushed aluminium can with its matching pink basecoat attracts attention immediately: The delicate transparency provides special perceived value but still leaves enough room for the premium look of aluminium. The conspicuous, almost aggressive red and black design emphasizes the can’s compact form and clearly retains its metallic look. Embossed triangles with raised burls add an extra feature to the design. 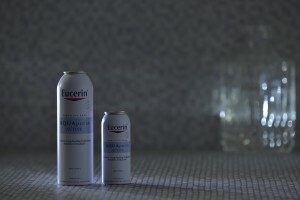 The cans come in many different shapes and sizes. 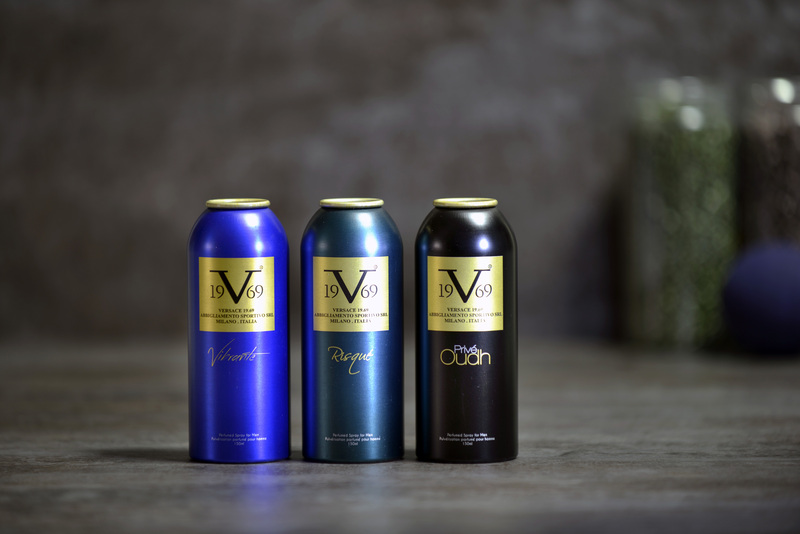 But a special process ensures that the printed logo always appears to be round after shaping and necking regardless of the form of the can. Depending on the base color of the container, the printing process and the color are controlled in such a way that the bright blue from Nivea is obtained despite the transparency effect. Aluminium’s expensive-looking metallic appearance forms the basis and is given an impressive additional finish with an intricate gold-coloured structure in the upper and lower parts of the can. The appearance of the dark aluminium can with its detailed, flowing ornamental patterns is no less exclusive.